Annie's Artist Lookbook: James Thomas Candle Co. Passion for Making that Burns Bright Like her Handmade Candles. Quality & Luxury in Small Batches Designed to Burn Extra Hours. 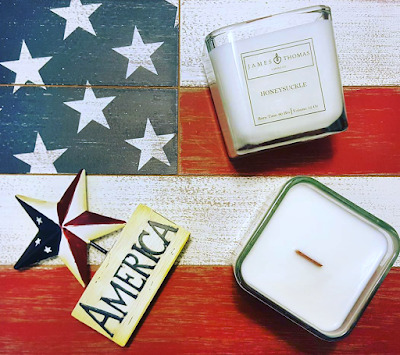 Images by James Thomas Candle Co.
A lot of artists become entrepreneurs when they decide they want to make a living from their creative passion, but for Rosie Jaimes the dream to own her own business came first, only to fully manifest when she discovered candle making. You could almost say that her heart melted as she first heated the all natural soy wax and mixed it with a lovely array of aromas. 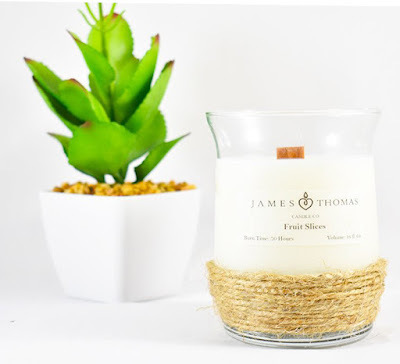 It didn't take long for everything to fall into place for James Thomas Candle Co. While there are plenty of candles on the market, what makes this Austin based business unique is their dedication to small batch luxury with Texas flair. Rosie uses high quality, all natural ingredients from the wick to the wax to the fragrance. You can expect these candles to burn bright and long with the signature cedar wood wick. Plus you get the added benefit of a comforting crackle as the flame helps fill your room with easy to love scents that have been preserved and elevated to set the mood. I personally go for the sweets inspired options like Fruit Slices. One whiff and it probably won't surprise you that Rosie also likes to bake. This affinity translates well to candle making as you start to create your own scent recipes. Rosie pulls from many different realms of fragrance to come up with the candles and "mandles" she offers. She's developed a truly winning formula! The other lovely aspect of James Thomas Candles is the thought put into display-worth design. These are not plain or homemade looking even though they have the same quality and personalization. Rosie has found an array of beautiful jars and tins that fit her vision of luxury. I love the gold travel tins so you can take your favorite scent with you! Rosie is a perfect example of why I believe in shopping local! Quality, passion and care come standard with every candle!